Never mind what you've heard about the backlash against globalization. We live in a world that still prizes that great symbol of global culture: the city skyline. Newly minted skylines have been rising at a furious rate in places where none ever existed before. One of the most famous, Shanghai's Pudong, went from a swampy island to a dense, Manhattan-style agglomeration of towers in a mere 25 years and has become the template for other cities aspiring to make their mark in the global economy. With the completion of the 730-foot FMC tower later this month, that will now include Philadelphia. After Dilworth Park's success, what about City Hall courtyard? It's hard to think of Philadelphia playing in the same league as upstart megacities like Shanghai, Jakarta, or Dubai. Center City's skyline evolved over many decades and is the product of a 20th-century sensibility. And yet, in just 15 years, we have produced our own mini-Pudong on the west bank of the Schuylkill with an assertive trio of glass skyscrapers, FMC, Evo, and Cira. Developed by Brandywine Realty Trust and designed (mostly) by Pelli Clarke Pelli, none of the three can claim to be the tallest in Philadelphia, a title that will go to Norman Foster's 1,121-foot Comcast tower when it opens sometime next year. None are particularly groundbreaking as architecture, either, although the designs are all skillful. But collectively, the trio is powerfully transformative. Together, they shift Philadelphia's business district from Center City to the university area. Their presence is the clearest evidence yet that the city has cast its future with the new research-driven economy of meds, eds, and tech. Creating a new skyline from scratch was not Brandywine's original intention. Its CEO, Jerry Sweeney, didn't acquire the land for the Cira tower until 2000. At the time, Brandywine was a suburban office-park developer whose main interest was in establishing a toehold in the city. Then in 2007, two years after Cira opened, the company made a deal with the University of Pennsylvania for two blocks of waterfront property between 30th Street Station and Walnut Street. In the ensuing decade, Brandywine had produced a mini-neighborhood that includes offices, apartments, a hotel, restaurants, a small grocery, and the elevated Cira Green park. Later this year, it plans to insert a scaled-down version of the Reading Terminal Market on the ground floor of its underused Cira parking garage on 30th Street. Close to a thousand people now live in the district, and several thousand more commute in each day to work. The Dutch firm MVRDV is redesigning the ground floor of the Cira Garage on 30th Street to accommodate a food hall. Still, the Cira district isn't a neighborhood in the way that, say, Fishtown is. The forest of skyscrapers materialized out of nothing, on land once occupied by slaughterhouses and stone yards, and long cut off from the city by a tangle of highways, railroads, and off ramps. The reason the development holds together as well as it does is because the designs adhere to a single idea. All the towers are treated as gigantic faceted crystals, sheathed in taut blue glass. Though the original Cira juts its faceted prow out toward Center City, FMC's facet cleaves inward, as though the facade were split by lightning. At the 28th floor, where the building shifts from offices to apartments, the tower narrows significantly, following its faceted incline. The lobby of FMC looking out to the city. Evo, an 850-bed student dorm, was designed by Erdy McHenry, but the tower plays along with Pelli's themes. Though its blue glass skin is more animated, with metal panels thrown into the mix, its sloping roofline riffs on Cira's. Evo dips down to the east while Cira angles up to the west. You almost forget the three towers are scattered across four city blocks, with the old post office (now the IRS) and a parking garage separating them like the dashes of Morse code. If those blue glass forms seem familiar, it's because you've seen variations elsewhere. Pelli has designed dozens of faceted towers in cities around the world. Everything about its Cira designs, from their slick bluish facades, to their curated amenities, is part of the uniform of global capitalism. 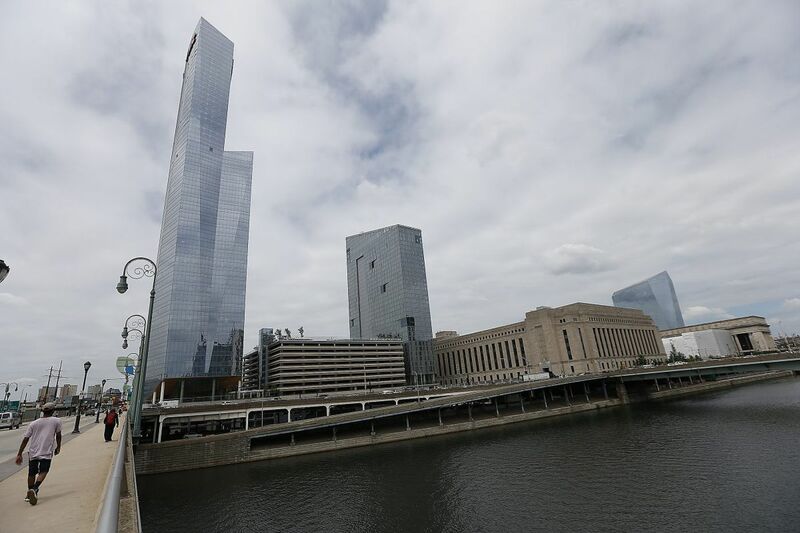 Like other skylines created out of whole cloth, the Cira towers look dazzling when viewed from afar (try the Schuylkill Boardwalk), but the development is more problematic when you have to interact with the buildings as a pedestrian at street level. After 12 years, the original Cira tower remains a moated island whose only pedestrian connection to the surrounding city is a skybridge to the train station. Neither Brandywine nor the city has made any attempt to improve the crossing at Arch Street, and, consequently, there has been zero economic spin-off. Brandywine and its architects have done better with FMC and Evo. Their sites, perched above Amtrak's Northeast Corridor and the I-76 Expressway, have always felt like a no-man's-land between downtown and the universities. The towers' frontages on Walnut and Chestnut Streets help pull the area back into Center City's orbit. The transparent lobby of the FMC tower connects it to the developing Schuylkill River corridor and Center City. The FMC's ground floor, in particular, promises to suture the two sides of the river back together. Pelli's lead designer, Mark Shoemaker, sliced off the tower's corners, showcasing its elegant glass lobby and a restaurant space. The gesture, which Shoemaker likens to lifting the hem of a skirt, creates two intimate plazas that offer surprisingly serene refuges from Walnut Street's speeding traffic. The streetscape also includes an elaborately faceted arcade that runs under the building's hem. Its underside is paneled with wooden wainscoting that unfolds like origami from inside the lobby and warms up the ground floor. The lobby and passageway are the fanciest piece of architectural footwork in the whole Cira complex. The arcade is such an interesting space that it should actually make people enjoy walking down this part of Walnut Street. Most people will probably head to the cafe-restaurant on the west corner, which is being run by New York's Michelin-starred Rebelle and will be open all day. But the east corner's plaza is an equally pleasant place to sit and offers a mesmerizing overlook of Center City and the passing trains. Where Cira falls down on the job, oddly enough, is along 30th Street. Despite a continuous series of ground-floor uses, Brandywine has done nothing to unify or soften the streetscape — no trees, no common design elements. "It's not enough to put shops in the storefronts," observed Janice Woodcock, who was city planner when the Cira district was conceived. More of concern is that lack of public improvements around the Cira district. Given what it took to build this new neighborhood from scratch, there has been surprisingly little investment in infrastructure that would calm traffic and make the area more welcoming to pedestrians. If money were no object, extending a cap over the Amtrak opening would dramatically transform this side of the Schuylkill into a real waterfront promenade. But even if that expensive project is beyond reach, the hostile Schuylkill Avenue speedway could be greatly improved by narrowing the roadway and widening the sidewalks. Walnut and Arch Streets need the same treatment. At night, when colored lights dance across the facades of the city's new, 21st-century skyline, Philadelphia really does appear to be a world city. The Cira district is an enormous accomplishment. But there is much more work to be done to make sure this emerging skyline really belongs in Philadelphia. Brandywine Realty Trust is updating the design of Cira Green.